Not content with saddling their daughter with a mouthful of a name like Millicent Marie (after a grumpy family member), Millicent Marie’s parents insist on calling her by that very same huge mouthful. Known to her school friends as Millie, Millicent Marie is grateful that she did not end up with a cool, arty, celebrity kid name like Organza. However, Millie decides that if she’d had a choice, her name would have been Amanda. Amanda has such a nice ring to it. After all, Amandas are beautiful, wildly popular, and talented. When Millie begins a diary in which she signs her name as Amanda, little does she realize what a ten-year-old annoying little brother (Douglas aka Doogle) can do to wreak even more havoc in her life. Doogle finds Millie’s diary on her computer and publishes it as a blog for the entire world to see. Amanda’s soul is suddenly laid bare and, amazingly, people love her. She becomes Springside Elementary’s most sought after sixth-grade mystery gossip and advice columnist. Can Millie keep up the pretence? And for how long before her cover is blown? This is a lovely read for tweens (and their parents!). Millie has the usual slightly disparaging attitude towards her prehistoric-age, totally embarrassing parents who (in the nature of all parents) seem to be incapable of treating her as the almost-adult she considers herself. Millie was given the choice of a computer or a cell phone when she turned twelve. Everyone knows that any self-respecting teenager needs both. 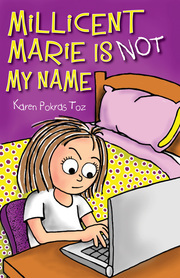 Author Karen Pokras Toz captures Millie’s life angst—from disillusionment with sixth grade, to decisions about doing soccer or drama, to denying she has a crush on the utterly handsome Jordan Cowell—with humor and inside knowledge. I also enjoyed Millie’s coming of age and gradual maturing. As Amanda, Millie learns huge life lessons about friendship, respect, and the fact that other people have feelings and problems. As Millie, Millie learns about her identity, who she really is, and decides if she is happy being herself. Highly recommended.